can anyone tell me how to check my exam results on the website??? When you log in, does it have a "CPC-A" after your name? Today was my 3rd time taking the CPC exam. The first two times, I didn't have tabs which slowed me down and I wasn't able to complete the exam and had to fill in a lot of my answers. Therefore, this time I put tabs in all of my books, wrote notes inside of my books, and I did the practice test more than once....with that being said I was able to complete the exam and I feel confident that I passed. Because lord knows, I really don't want to sit for a 4th exam my brain hurts too much from the constant studying! So good luck to everyone that's taking the CPC exam. 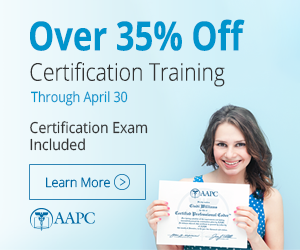 Have you all try ordering the webinar from AAPC call how to pass the CPC exam on your first try. I swear by this webinar, I failed my exam 2 times and then I order this webinar and it gives you the inside scoop on how to pass the exam. This was the best webinar I have seen so far and I can tell you that it works, I didn't want to just pass I wanted to score higher than 70 and I did. So before you go out and spend your hard earn money on something else, contact AAPC and inquire about the webinar. I promise you will not regret it! Beverly Taylor....do you PROMISE that it can help someone pass this test? I have taken the thing 4 (count 'em....FOUR!!!) times, and my grades have been: 60, 68, 66, and this last one was a 62. Cannot even begin to tell you how devastated I am. I had such plans for having those letters after my name....fixing up the house....first, KEEPING the house, repaying my parents, etc. But now I can't even seem to get dressed in the morning. All of my self worth is gone just because of that word: FAiLED. I just found out I failed the CPC exam, pretty badly (this is my first attempt). I know I have to do better, and do something different but I really am clueless as to how to pass this exam. I swear by the Blitz Review videos offered by Coding Certification.org. Laureen has such helpful tips, and she actually shows you the notes she has in her CPT book. She has a special method of grouping the CPT codes together and even though it is a time consuming process, I truly believe it helped me do very well (and pass) my CPC exam on the 1st try. I'm a visual learner and her videos really worked for me. Check out her website and some of her videos on Youtube to get an idea of her teaching style. Last edited by semillhouse; 05-27-2014 at 10:35 AM. I am so excited! I passed the CPC exam on the first attempt! That really was the hardest test I have ever taken and I am glad that is over. Good luck to everyone taking it!